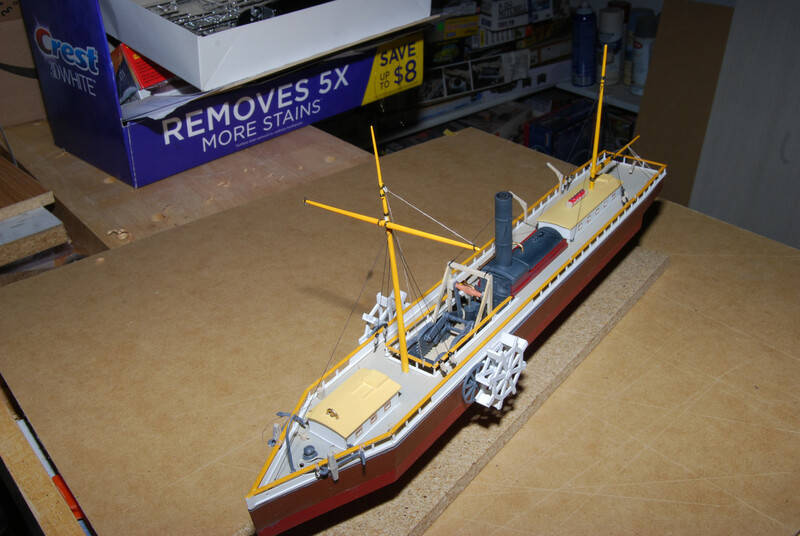 I know, it was reallly called the North River, and that is what I'll put on the model, but for those looking for the kit, I wanted to use Lindberg's name. Here is what I've done so far. It seems to be fairly accurate as far as what anyone knows what it really looked like. It does look like a replica built in 1906, and some of the paintings and drawings. I actually built the motorized version because a non- motorized version wasn't available .Didn't run to bad either ! I still have problems with the bow area .I think the Bow area was a somewhat smoother angle than what the model represents . I wondered about that bow too, but both text and paintings seem to agree with kit. Also, I believe the 1907 replica features that style bow. I found a few discrepancies in the drive, but I suppose some liberties were taken to allow the electric motor drive in the kit. You may be right . I always thought that he had the hull built by a bunch of guys that built barns ! Certainly didn't use any shipwrights did he ? Yes. he did use a real shipyard. But he told them to simiplify design because it would not be sea-going. US rivercraft were often build to weird shapes, as in the Western Rivers steamers. 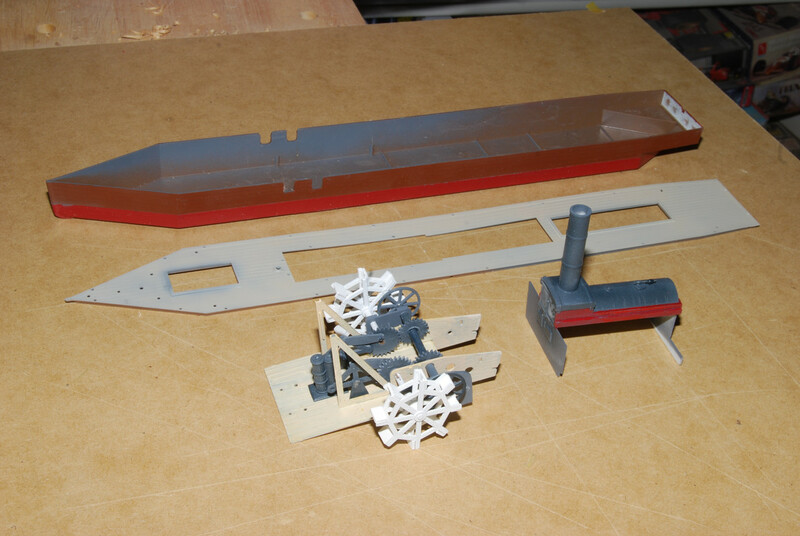 Okay, got the machinery installed, the deck on, and the deckhouses. Now I have to do the railings, deck hardware, and spars and rigging. Also, do the real base- what is on now is a temporary building base. Looking good! That's a fun kit. There are dozens of interpretations of the North River Steamboat. Way back in 2015 I started some research on it using the Library and internet. I also looked thru several forums. I recall you were on several of the FSM posts. There are correct plans of the engine but no so-called "plans" of the ship which can be authenticated. It is another one of those "nobody knows for sure". The Lindberg and the ITC kits do have a nice representation of the engine. Since Lindberg's actually "works" it is the better kit to build. Of course it is the only kit out there these days. With my research I always felt the Lindberg kit seemed closer to an 1807 version whereas the old ITC kit seems much closer to the 1909 replica that was made. If course, with no good plans in existence, we can't know for sure. "...Professor Renwick, describing the "Clermont" of 1807 as she appeared on her first trip, says: "She was very unlike any of her successors, and very dissimilar from the shape in which she appeared a few months afterward. 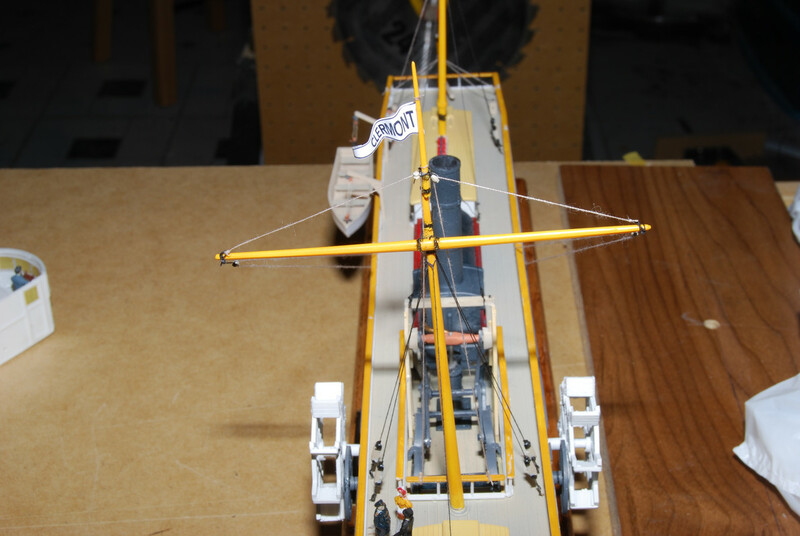 With a model resembling a Long Island skiff, she was decked for a short distance at stem and stern. The engine was open to view, and from the engine aft a house like that of a canal boat was raised to cover the Boiler and the apartment for the officers. There were no wheel-guards. The rudder was of the shape used in sailing-vessels, and moved by a tiller. The boiler was of the form then used in Watt's engines, and was set in masonry. The condenser was of the size used habitually in land engines, and stood, as was the practice in them, in a large cold-water cistern. The weight of the masonry and the great capacity of the cold-water cistern diminished, very materially, the buoyancy of the vessel. The rudder had so little power that she could hardly be managed. The skippers of the river craft, who at once saw that their business was doomed, took advantage of the unwieldiness of the vessel to run afoul of her as soon as they thought they had the law on their side. Thus, in several instances, the steamer reached one or the other termini of the route with but a single wheel." Got the spars up, and standing rigging done. Started on running rigging. Got the rigging done now except for rope coils and belaying pins and bits. I don't coil the actual lines. I make seperate coils with a short end that glues onto pin. A lot easier, but still a tedious process. Almost as bad as ratlines (fortunately the boat does not have ratlines). Big problem now is base- my table saw is down. I used my chop saw to get a square end to base. But I usually use table saw for some groves for molding. Guess I will have to use router for all the molding. I might simplify base from what I usually make. 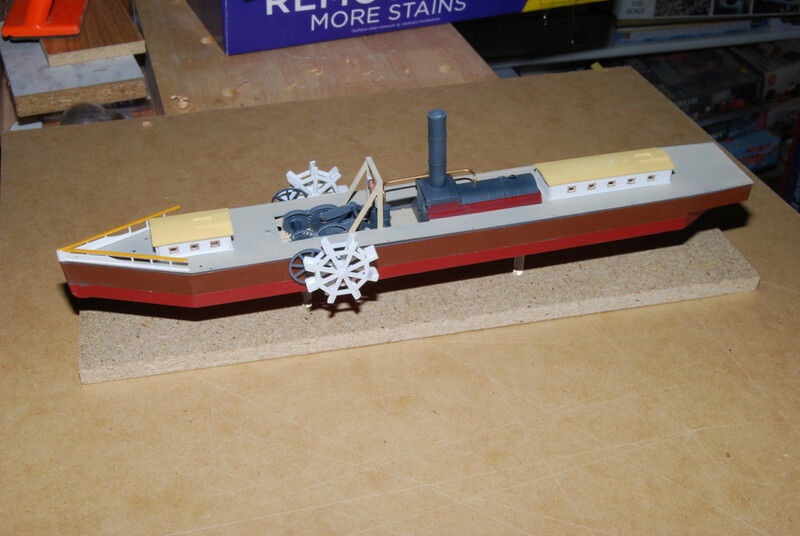 Don - your build of this first commercial steamboat looks fantastic. Compliments on this one ! Sometimes it's nearly impossible to get the yard a scale dimension in any material and keep it rigid, short of turning it out of a brass rod. I don't own a lathe, although I recently bought a bench top drill press. I've made masts out of wood other than birch dowel, which is rarely straight to begin with and is hard. I make a square piece, then turn it into an octagon in section, then 16 faces and so on. I find it easier to control the taper and keep it straight. I hope the re-work of the rigging goes well. I'll be watching intently. I will use your rigging of the yard as my guide when I do the old ITC kit. I fear to look at those ancient parts. Maybe a hot bath in the tub will straighten'em out. Pssst... What size blocks did you use? They are the ones that came with the kit. Being too lazy to go downstairs to measure them, they are about 3/32 in size. The deadeyes that came with the kit are interesting. No rigging, cast as an assembly- just glue them to the stays! Best simulated deadeye assemblies I have seen in a kit.